As today’s tax map shows, real property taxes vary greatly across European countries. Real property taxes are levied on a recurrent basis on the value of taxable property such as land, often including buildings and structures on the land. Because land is an immobile asset, property taxes on the value of land are generally seen as an efficient way to raise tax revenue. However, if the tax also applies to buildings or structures on the land, it becomes a direct tax on capital. If a business builds any new buildings or structures, it results in a higher property tax bill. This increases the cost of business investment, discourages the formation of new capital, and can negatively impact business location decisions. Property tax collections as a percent of a country’s private capital stock reflect the burden of real property taxes in an economy. Higher tax burdens, especially on capital, tend to slow investment, reducing productivity and economic growth. 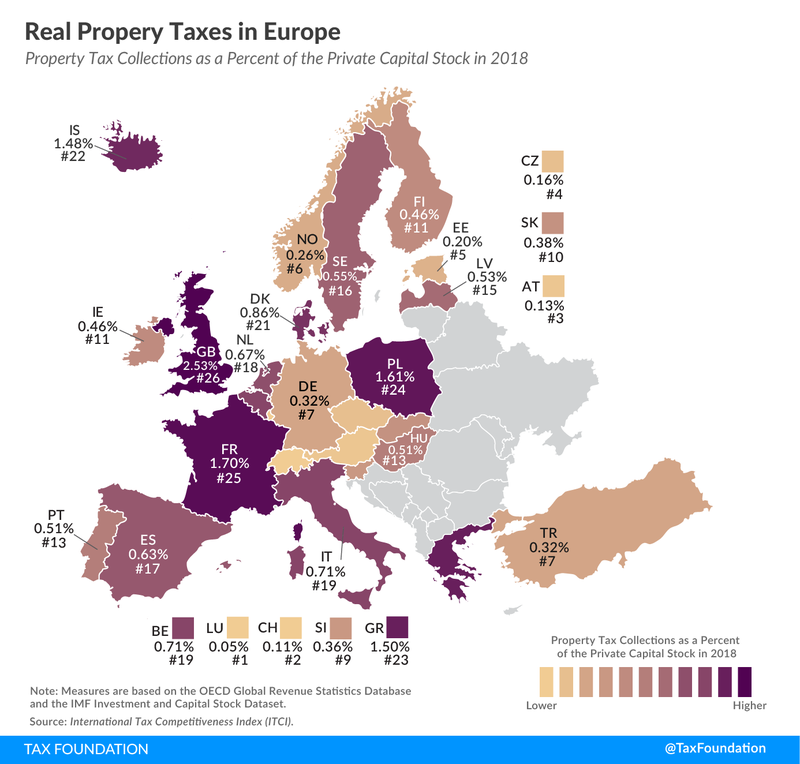 Luxembourg collects the lowest property tax as a percent of its private capital stock of all European countries covered, at 0.05 percent, followed by Switzerland (0.11 percent) and Austria (0.13 percent). The countries with the highest property taxes are the United Kingdom (2.53 percent), France (1.70 percent), and Poland (1.61 percent). Estonia is the only European country on our map that taxes solely the value of land (excluding the value of buildings and structures on the land), making it the country with the most efficient real property tax. Some countries allow their businesses to deduct real property taxes paid against corporate income, mitigating the burden of the tax. Nine out of the 26 European countries covered allow for such a deduction. Property tax collection measures are based on the Global Revenue Statistics Database, private capital stock measures on the IMF Investment and Capital Stock Dataset, and information about deductions on the Deloitte Tax Guides and Highlights.Source: International Tax Competitiveness Index (ITCI).